One of the UI components we use often is Android ListView. This tutorial describes how to use this Android UI component and how to use it in the right way. One interesting aspect is this component can be deeply customized and can be adapted to our needs. This post wants to analyze the basic concepts behind it and how to use this component. In order to show items inside the list, this component uses an adapter, so if we want to populate the list we have first create or use existing adapters. Android SDK has some standard adapters that are useful in many cases. 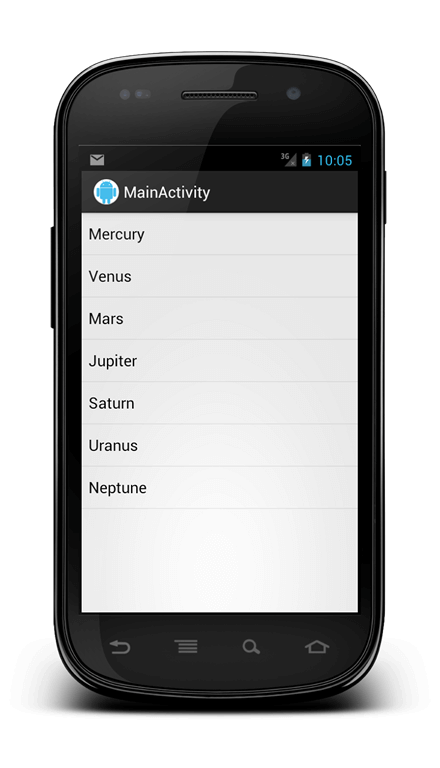 To understand how we can use this UI component we can suppose we want to show a list of planets. To make things simple and focus our attention on the ListView component we will use, by now, a very simple and basic adapter called SimpleAdapter. 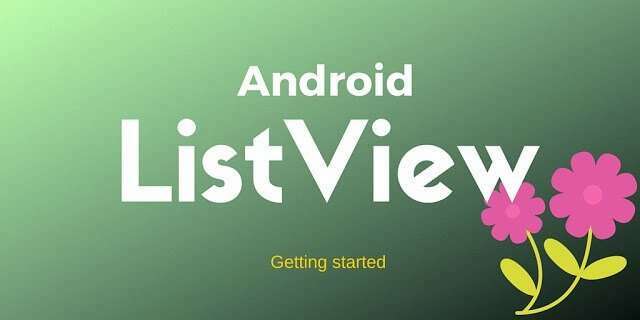 So let’s create an android project to show how to use Android Listview ArrayAdapter. In this project, create an activity called MainActivity and a layout called activity_main.xml. This layout is very simple, it just contains the listView component. where the first parameter is the context reference (our Activity), the second the data we want so show in the list. The 3rd is the layout we want to use for each row in the list. In this case we just used a pre-built layout shipped with Android SDK that you can find inside the android sdk directory and then platformsandroid-16datareslayout. This is a very simple layout that contains just a TextView with id text1. The 4th parameter is an array of key used to retrieve the data from the Map. Each list element of java.util.List represents a row in the ListView and each element inside the row must have a unique key that is used to retrieve the element content. In our case to make things very simple we just used planet as key. The 5th element is an array of int representing the ids of the View inside the row layout. In our case is just text1 id. Please notice that the keys array length must match the ids array length. Once we have created our list and populated it with the items we want to interact with the user giving the chance to click one item or maybe show a context menu. To do it we have to register some listener. When the user clicks on an item we simply show the position and the id of the item clicked using a simple Toast. What do we do with this method? Well, first we call super to let the SO makes its work. Then we cast the ContextMenuInfo to AdapterContextMenuInfo because we are using a ListView. The AdapterContextMenuInfo has an attribute that holds the item position clicked so we use this information to retrieve the item information. We know we are using an HashMap to represent the row so we cast the result to HashMap. It is the time we create the menu. First, we create the menu header using the name of the planet retrieved using the HashMap and then set two options “Details” and “Delete” with different ids but belonging to the same group we called “1”. Before running our project we have to modify onCreate method, to register our MainClass as the handler for the context menu for the ListView. In this case, we simply show a Toast with the menu item id. One aspect we didn’t consider is how to apply a style to Android list view background. We can customize the look of the Android ListView background in the way we like, for example with can use as background rounded corner, alternate color and so on. By now we considered just custom adapter without taking into account how we can customize how each item inside the listview appears. We want to describe how we can use a resource to customize the item look. 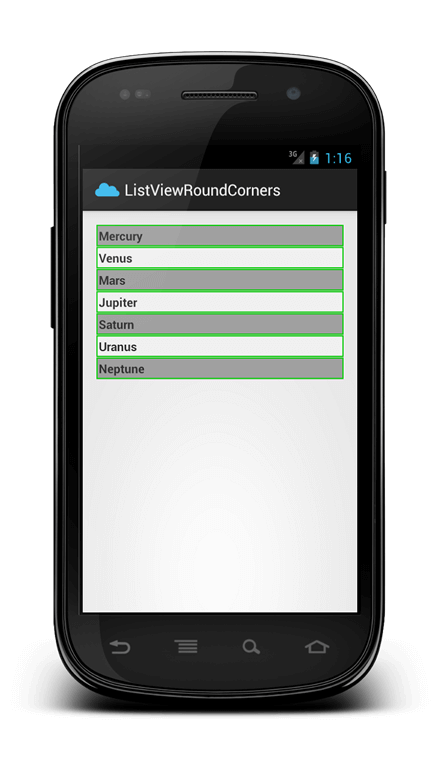 The first example will describe how we can create rounded corners for each item inside a listview. In the second example, we will show how we can alternate the background color. Let’s suppose we want to create an Android ListView background with a rounded corner for each item. How can we do this?…We need to create some drawable resources and apply them to each item. As you already know we have to create a custom adapter to implement this behavior. 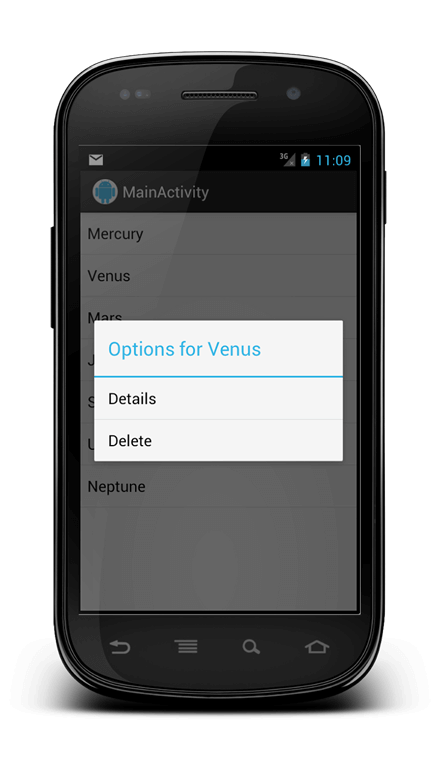 As you can notice the Android ListView background is customized using our style. You should type this code in the Main activity for the part regarding event handler. can we download the entire project..? I'm glad you like my work. I hope this post will help yo. can i post my code here ? Will u please tell how to display data in Expandable list using JSON? Very nice .. Thanks a lot for this help..
while running the listview code mentioned above, i get a message – 'unfortunately your app is closed'. Can you please advice what is the possible reason for this ? Thanks. I see the codes like this, and it confuses me.